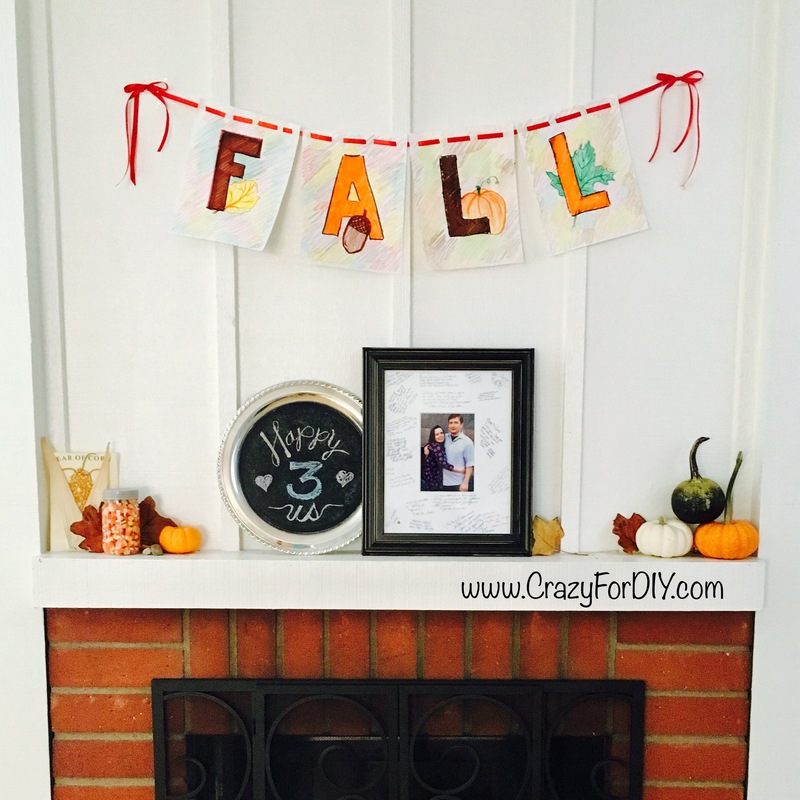 Fall Decorated Mantel – Crazy for D.I.Y. October 21, 2016 March 3, 2018 • Crazy for D.I.Y. We moved into our new town house 4 months ago and it’s been a breathe of fresh air. Boys have their own room, wood floors so they can play their trains and cars and the best perk in my opinion is having a fireplace mantel. I’m so excited and fired up to be able to decorate a part of the house the kids can’t reach and pull the pretty decor down. I forgot to do Halloween first and just went straight to Fall. I’m starting out… so I don’t have a lot of fun pieces but I’m looking forward to many years of adding more diy art. This week was our 3rd anniversary 😍 and I finally got to frame our sign-in mat. Yay! Then my husband’s step mom made us a wonderful serving tray chalkboard display. My crafty heart skipped a beat when I opened this! Can’t wait to play with chalk art! The fall banner was a quick craft. Took 30 min to draw on printer paper with markers and crayons while the boys were napping. Found some red ribbon in my stash and took my exacto blade and cut slots for weaving. So easy. Next year I think I’ll do something more involved with burlap and maybe gold. There’s a corn stalk craft my son made and leaves he collected outside. Candy corn in a mason jar (a must and impossible not to eat!!). 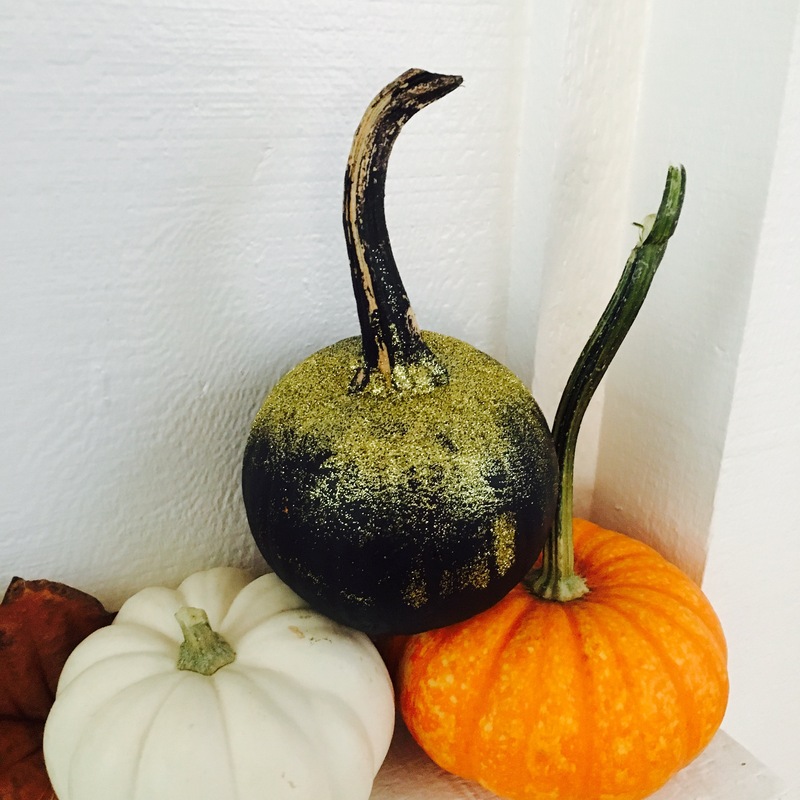 A few small pumpkins and one my son painted black and sprinkled with gold with his Granny. Posted in CraftsTagged banner, chalkboard, decor, diy, fall, hand drawn, happy, home, mantelBookmark the permalink.